As a general matter, once the government acquires information from a permissible search or seizure, it can use this information in later criminal investigations. Courts have applied this simple rule to uphold the indefinite reuse of DNA samples acquired from convicted offenders. 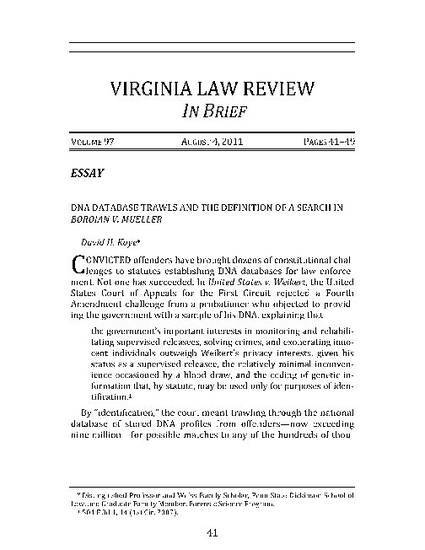 This essay describes the First Circuit Court of Appeals’ reliance on the rule in rejecting a convicted offender’s claim that his DNA sample and profile had to be removed from the federal DNA databank after he completed his sentence. Acknowledging that the rule permitting reuse should not be applied mechanically, I argue that the rule's application to DNA databases is correct because merely retrawling a database for matches to a crime-scene sample does not implicate any cognizable Fourth Amendment interest. This article was originally published at 97 Va. L. Rev. Brief 41.